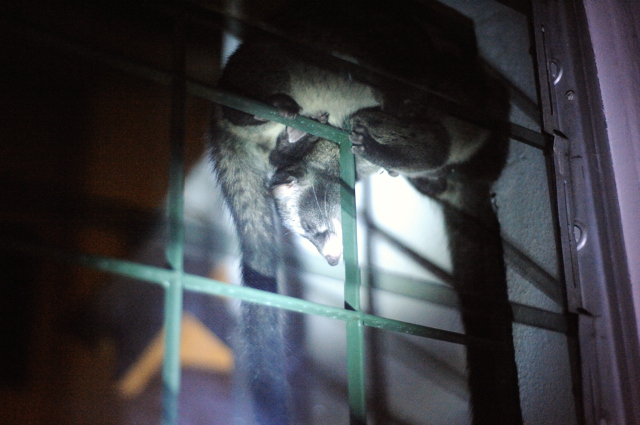 “I have civets living in my attic too. But my closest encounter occurred early yesterday at about 4am. I was rudely awakened when I heard noises at one of my bedroom windows. 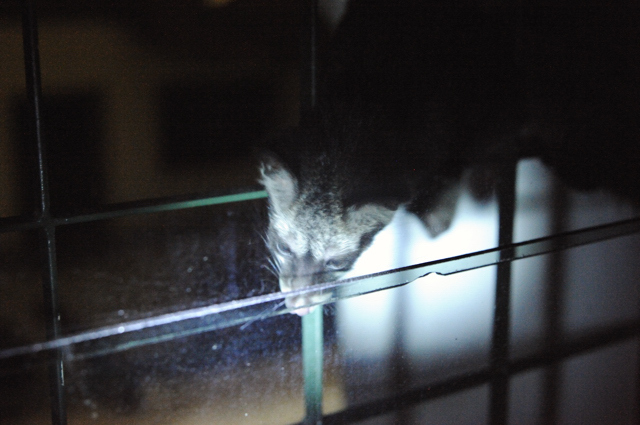 When I went to investigate, I was startled when I found a family of four civets outside. Two larger civets which I presume to be the adults were on the roof, whilst the other two smaller civets or pups were hanging or playing on the iron grille”. I'm interested to explore how far wild animals can co-habit our cities and towns. In the countryside, the fox-like civets are considered as pests because they prey on the chickens. I would like to think that there would be less conflict in urban areas – where humans and civets can adapt to each other. “But in the urban environment, I am thinking of the potential threats these civet cats can have on our domesticated animals. My concern arises as I have two little dogs, four cats and a sulphur crested cockatoo. Furthermore, civet cats in China are also believed to be carrying a coronavirus that is very similar to the SARS virus in the faeces and secretions. Here is the link. Thus, could our urban civet cats be carrying some dangerous diseases too? I really do hope not as I find them kind of cute but nevertheless there is a worry as I have found lots of the civet cat's droppings on my roof”. It appears that the local ‘squirrel’ or ‘tupai’ has adapted very well to urban habitats, but most experts now come to the conclusion that monkeys don't adapt well to human contact. Are there any wildlife experts out there who can tell us on how to best deal with the civets in town areas? Thank you very much Colin for the email and photos. I wish we were wildlife experts but we are not. So I will pass on that Svet just loves your articles about the animals & trips! Thanks for good articles as always. Thanks for the link. That is a great house! I wonder if the door pulls up to the bottom like a real spaceship door.